A Northumberland Motor Racing Legend In The Making? 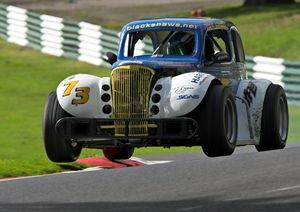 Chris Grieve, son of Barrasford based motor mechanic Willie Grieve and grandson of Barrasford Garage's Walter Grieve has triumphed by winning the UK Legends Motor Racing Series. The new UK motor racing champion won the crown by clinching a win in the second race at the Cadwell Park circuit in Lincolnshire on Sunday. This success could lead to great things from the Tynedale speed demon, part of the three generation team at Barrasford Garage. 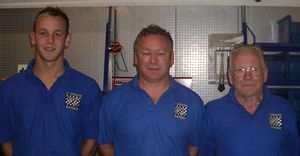 Chris made his debut in the National Legends Championship in 2005 taking second place to Peter Morton. Chris is 21 years of age like his dad and granddad is a mechanic by trade. In 2004 Chris raced in the Legends Scottish Championship and took 7th place, (4 wins, 3 fastest laps). He is the Knockhill circuit lap record holder and also raced in the National Legends Winter Weekend taking the 2nd place trophy (1 win, 1 fastest lap). Chris first drove a kart at age 5 then raced in Comer Cadets from age 8 to 12. He moved onto 100c Karts from age 13-16 then Short circuit 125 Gearbox Karts from age 16. He had many successes in karting including the 2002 Open Championship. Father Willie was a renowned Kart racer who competed across the UK.